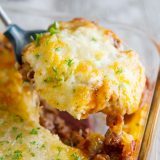 Family friendly and a crowd pleaser, this Puffed Up Pizza Casserole has a ground beef layer topped with an easy, cheesy homemade dough layer. This one is a hit with kids and adults! In a large skillet over medium heat, cook the ground beef until browned, breaking up as you cook it. Drain, if necessary, and then stir in the onion and green bell pepper. Let the vegetables cook for a couple minutes, then add the tomato sauce and water and stir to combine. Add the dry onion, cornstarch, oregano, basil, sugar, salt, garlic powder, and celery salt. Stir to combine, then cover the pan, reduce the heat to low and let simmer for 10 minutes. Pour the meat mixture into a 9×13-inch baking dish. Pour the liquid mixture evenly over the top of the meat. Sprinkle the mozzarella cheese on top, followed by the Parmesan. Bake in the preheated oven until puffed and golden, about 30 minutes. Let stand for 10 minutes before serving.